National Trail’s Makena Laird is pressured during the Blazers game at Mississinawa Valley on Thursday, Jan. 10. Trail used a strong second half performance to pull away for a 61-41 win. 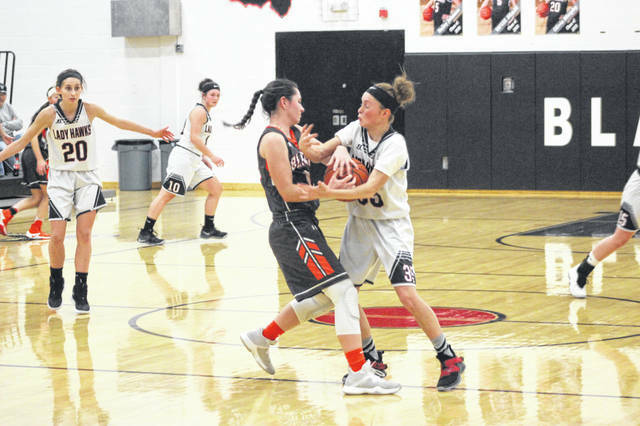 UNION CITY — National Trail used a strong second half performance to make sure Mississinawa Valley girls basketball team remained winless in the Cross County Conference on Thursday night (Jan. 10), cruising to a 61-41 win. 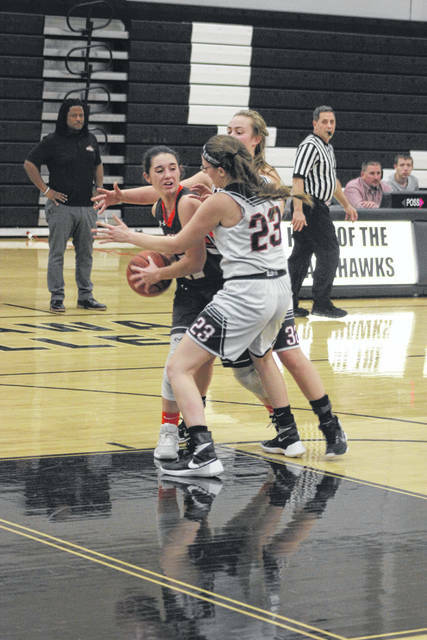 The Lady Blackhawks clawed their way to within two points at 26-24 at the beginning of the third quarter on a basket by Kya Lavy, but the Lady Blazers fired away on all cylinders for a 12-0 run over the next four-plus minutes pushing the lead to 14 points (38-24) and never looked back. 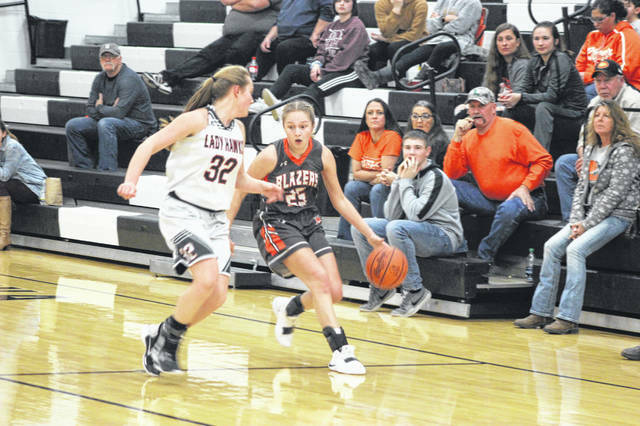 It was another Lavy bucket that broke the Blazers run, but Trail got a pair of 3-pointers from Davlyn Werner and Skyler Ward to close out the frame with a 47-32 lead. Mississinawa’s Taylor Stachler had a triple of her own sandwiched between Werner and Ward before the quarter ended. “We fought hard and we played well, but we just got tired and started to get a little lazy and they pulled away,” MV coach Michael Paige said. “We had four girls hurt so our bench was short. Our starting point guard is out with shoulder injury and then (Taylor) Collins is out with a concussion. We actually had to put one of our varsity players on JV today to help them out being short of players and we just got tired. Makena Laird opened the fourth quarter with her fourth 3-pointer of the game to stretch Trail’s lead to 50-32. Ward then hit the first of two free throws and capped a 7-0 run with her only trey of the game and it was 54-32 in favor of the Blazers. Laird and Ward each totaled a game-high 18 points in the win for National Trail, which sank eight three-balls for the entire game. Laird had four of them, Ward two and one each from Evan Byrd and Davlyn Werner. “Ward had 18 points and was really strong today,” National Trail coach James Byrd said. “I don’t know how many deflections she had, but if I was to guess I’d say 15. Laird shot the ball really, really well too. Mississinawa found itself in an early 7-0 hole to begin the game, but rallied back to a 13-8 deficit with seconds to play in the first quarter. However, Ward connected on her first 3-pointer of the game as the horn sounded to push the Blazers lead to 16-8 at the end of the first eight minutes of play. It was the second quarter that the Blackhawks found most of its production. MV outscored trail 14-10 in the second frame largely behind the aggressive play of Sidnie Hunt, Olivia Murphy and Lavy. Hunt had 6 points in the quarter while Murphy and Lavy had 4 apiece. That made the score 26-22 at halftime in favor of National Trail. 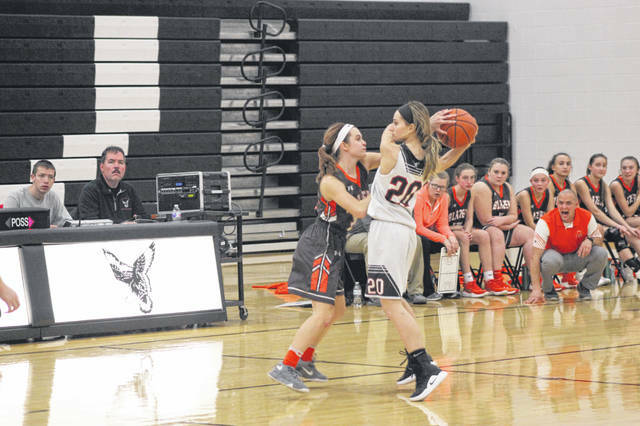 Mississinawa had a 7-0 scoring run of its own in the period and then got within two at the start of the third quarter on Lavy’s bucket, but could not get any closer in the eventual 20-point loss. “Kya and Sidnie had great games today,” Paige said. “We knew that we could be successful down low against this team so we tried to work it to the post and tried to do some things to slow them down a little bit because we knew they were a faster team than us. Hunt led the Lady ‘Hawks with 13 points and Lavy added 12. Mattie Hiestand had 5 for Mississinawa Valley and Murphy and Stachler had 4 each. In addition to the 18 points each from Laird and Ward, Werner and Abner had 9 each for Trail. “Early on I thought our press was good at speeding them up and getting some turnovers, but we didn’t transition back well,” Byrd said. “I thought we were a little sloppy on defense, but our half-court man-to-man ended up creating a lot of issues for them that turned them over and got us easy buckets. Trail opened the week with a 48-39 win at Carlisle. Solid defense and clutch free throw shooting helped the Blazers snap their losing streak. 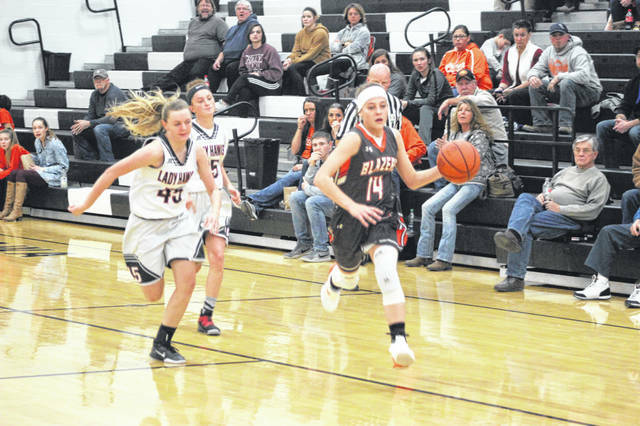 Makena Laird had 16 points, Evan Byrd tossed in 15, and Skyler Ward with 11 points led a balanced attack for the Blazers. Savanna Abner controlled the game and Bobbi Grimes was outstanding anchoring the post on defense, according to coach Byrd. Trail had its game with Newton, which was scheduled for Saturday, Jan. 12, postponed. Trail (9-6, 3-4 CCC) is scheduled to play at Tri-Village on Thursday, Jan. 17.
https://www.registerherald.com/wp-content/uploads/sites/41/2019/01/web1_ntgbk5.jpgNational Trail’s Makena Laird is pressured during the Blazers game at Mississinawa Valley on Thursday, Jan. 10. Trail used a strong second half performance to pull away for a 61-41 win.